I hope no one minds me doing a guide, but I see so many posts from people saying that they don't know how to post a picture, I felt it was worth doing. 2. Upload the image to a web host. 3. Link to the image in your TZ-UK forum post. 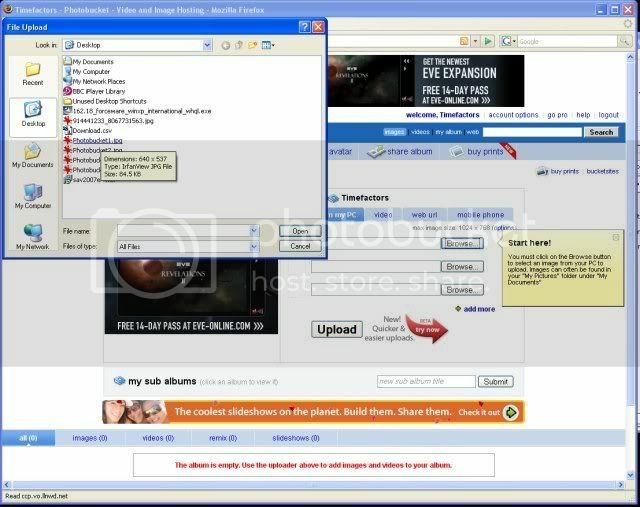 There are many websites that will host/store pictures for you. Your choice of host makes no difference when you come to post your picture on the TZ-UK forum. Flickr (http://www.flickr.com/) is recommended by several forum users, but I have chosen to use Photobucket for this guide (as that's the hosting service I use and am most familiar with). 3. Fill in the stuff on the next page. There's no confirmation step, so you can chose to be called Donald Duck if you wish. You will notice that I chose the name "Timefactors". When you've done all that, click the "I accept. Sign me up!" button. 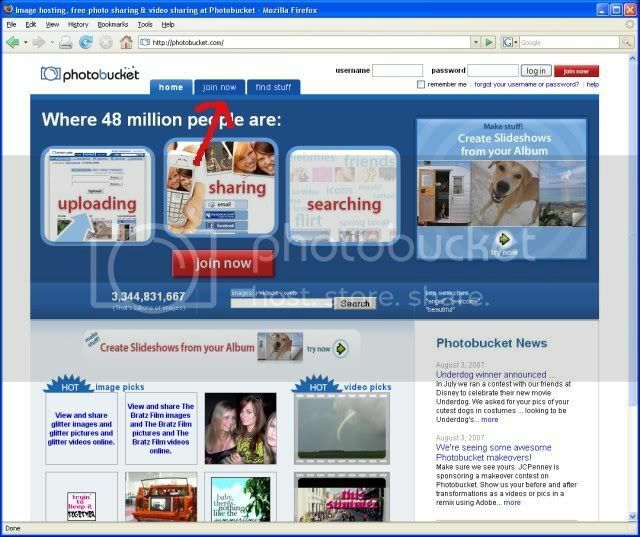 ...navigate to the folder on your PC where you have your picture stored, and select it/double click it, and the image will be selected for upload to Photobucket. 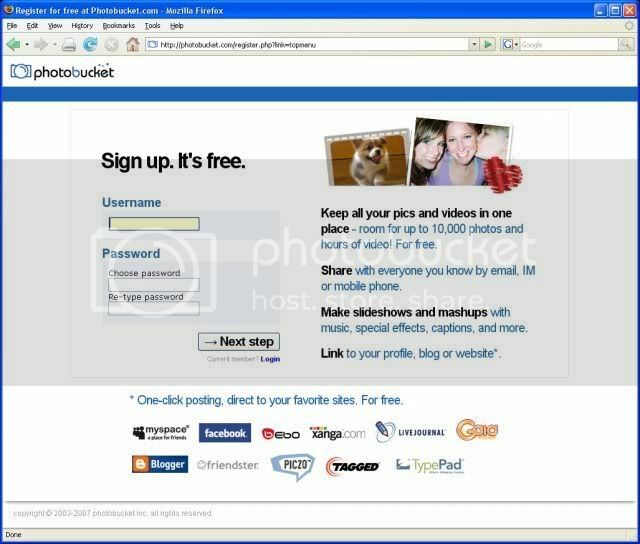 In the following image, you can see that i have selected a picture called "Photobucket1.jpg". 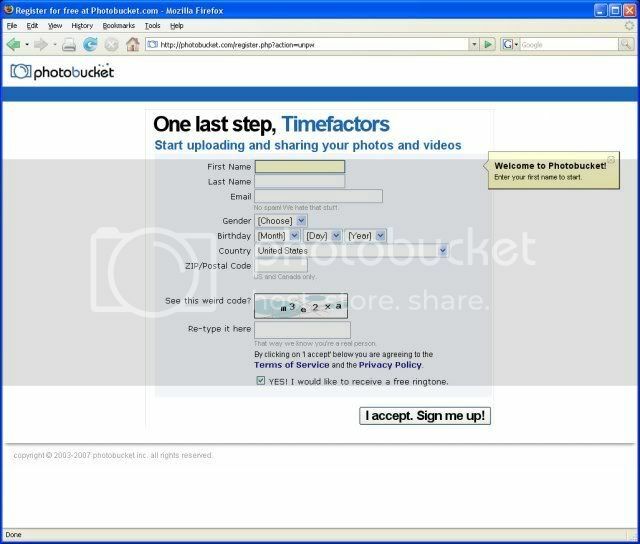 Photobucket has automatically created a folder in its hosting space called "Timefactors", where it will store any pictures that I upload. Note that the image has not been uploaded yet. At this point, you can click another browse button to select further images to upload, or just proceed to the upload stage. You do this by clicking the "Upload" button. Left click anywhere in the text box next to the "IMG Code" label - i.e. the bit where you can see "http://i195.photobuc" in the picture. When you click, a little yellow box saying "Copied" will pop up. 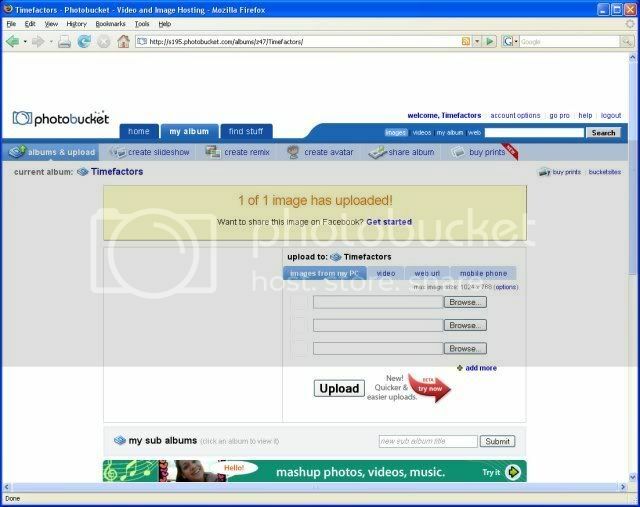 This means that you have stored the link to your picture in your PC's clipboard/memory. Update: It doesn't always auto-copy any more. If it doesn't for you, do the following: Left click anywhere in the text box next to the "IMG Code" label - i.e. 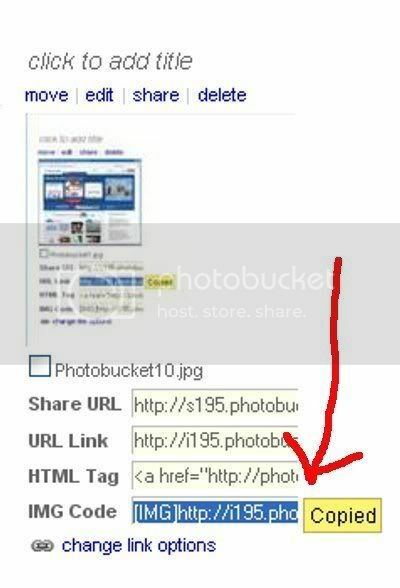 the bit where you can see "http://i195.photobuc" in the picture. The text in the box will be highlighted. Right click the mouse, and select "copy" from the pop-up menu. That's the end of the section on image hosting - we have stored our image on a hosting site, copied its location, and can now move to the TZ-UK forum. ...and there you go. Finish typing your post. Insert any other images you wish to put in your post, and submit the post. It's a good idea to preview your post to make sure that it's all formatted correctly. One final comment is regarding the size of the pictures you post - don't post big ones, or they break the formatting of the forum. Please see this thread for details: http://www.tz-uk.com/forum/viewtopic.php?t=224. If you use Flickr to host your pictures, then sizing is done for you. Edit: Thanks to magirus and vagabond for help with the use of the Photobucket IMG Code, and GeoffD for the Flickr recommendation. It is a great idea! Thanks. 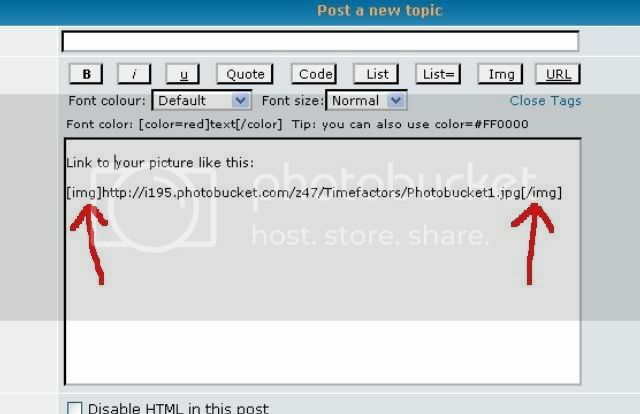 To simplify the process, when copying the Photobucket link, instead of using the URL link copy the IMG code and paste into your post. This removes the need to select the Img button from the list of tools. Just would like to add my tuppence ....... you can also copy the "IMG code" link from Photobucket (usually under the URL option) - this already has the [img]tags%20applied%20to%20the%20URL%20so%20you%20don't %20need%20to%20bother%20with%20the%20[IMG]%20..[/img] buttons when posting in TZ-UK and it makes it easier to place your pics anywhere in the post. I'd only like to add my recommendation for Flickr as the hosting service, particularly for those without the ability to re size the photo's before uploading. Flickr offers the option to re-size the image before uploading and a range of sizes for posting once uploaded. Incidentally, how do you get those nice screen-grabs? I've always found the PrtScn button a complete mystery. Jumping in here... In Windows you press PrtSc (PrintScreen) once, that copies the entire screen to the clipboard as a bitmap. Then go to an image editing program capable of creating a new image by pasting, and just press Ctrl-V. You may need to have another image already on screen (i.e. an open file into which you then paste the screen grab), and take care to save the image from the image editor under a new name. I use Faststone Image Viewer for this, as you then can again select and copy a part of the imported image and paste it as a newer image again, so you can simply copy the part of the screen image you need without resorting to a special screen grabber program. Faststone also allows you to resize/resample a picture through its Edit menu, it is quite simple. And Faststone is free. You can also use the PrtSc key and Ctrl-V to copy and paste a screen grab into a wordprocessor, for instance. "PrtScrn" just copies the whole screen to the clipboard. You still need some kind of graphics capable package to then paste it into for saving. Paint Shop Pro (lots of free copies around) has a good screen grab utility built in. Thanks for the comments guys. I'll update the [img] tag bit when I get chance. The PrtSc button copies the whole of your screen. Pressing the Alt and PrtSc buttons together captures only the active window, which is how I captured the screenhots. If you use ALT + PrntScrn - this grabs only the active window and not the whole screen. Thanks for putting this together Hog, the screenshots will make it a lot clearer to novices. I prefer using http://www.tinypic.com, the reason is that it's a simple process, you just hit browse, find the picture on your harddrive and then hit upload, after that it actually gives you the tags in the box so you just cut and paste straight into the post. A useful how to guide , now could some one explain why there are never any batteries in the camera when you want to use it . Because the wife took them for the television remote control, or something. Is there a maximum image size you would recommend for ease of uploading? I think that the max size the forum software will allow you to upload is 800pix wide. But anywhere around 700 wide is fine for most people. I can't seem to get an Avatar up on this site. I belong to dozens of forums,,,, & use avatars on them all. I use PhotoShop (v7) & Photobucket. Whenever I try to insert Avatar it always comes up with Too big - only 120 x 80 pixels is accepted. Fairy Nuff - there has to be a limit. I have tried images down to 20 x 20,,, but are still too big. I then see that regardless of physical size - the max res is 6kb ! I'm struggling to get an image down to 6kb. I'm trying to use an aeroplane propeller, in an upright position in this case,,,, so it's a tiny tiny file,,,,, but if I can mange to get it down to 6kb,,,, you can't see it. As I say, I know i'm a bit simple,,,, so can someone be kind to an old geezer & give idea where i'm going wrong ? If you're saving it as a JPG, save it at a lower quality and you'll have no problem getting it down to 6kb. Can anyone tell me how I get the 'img' code for flikr please? London - just follow the sounds of champagne corks and screaming. Hit the 'img' button, paste in the URL of the picture, then hit the 'img' button again. Job done. Ah, answered my own question, had too big a pic. Both they and I am lost..... ?????? Just a query about pictures in threads-Mostly the pictures appear within the thread and some times there are links to pictures,how is this link created? If you just want a link, leave the [img] tags off the address. Thanks Gordon, invaluable information, managed to muddle my way through and post my first pic tonight! "Good", it is not but with practice and helpful advice my photography may improve. Which hosting company are you using? Thanks for the guide - I am slowly learning! I've been having problems with copying the IMG link on photobucket. It doesn't paste onto the TZ screen?? Am using a Mac and Firefox as browser? Is this some kind of a glitch? The image url should be placed within img /img tags using the buttons above the Reply box and be no more than 800x600 pixels in size. I've noticed that it's stopped auto-copying, as well. Click on the field so that it high-lights, then right click and copy. thanks, thats brilliant because i didnt have a clue ,still dont but hopefully my daughter will sort it out for me! Thank you. This topic is very useful.